Reader: At the store, dummy. Another Reader: At the farmer’s market, dummy. Yet another reader: Pushing a cart, dummy. WHOA, y’all. None of you are Redd Foxx, so you cannot legally say dummy that much. When I say “how do you shop,” imaginary readers in my head, I mean this: what’s your approach to shopping? I’d say that I’m a French shopper living in the Piedmont Triad area. For instance. 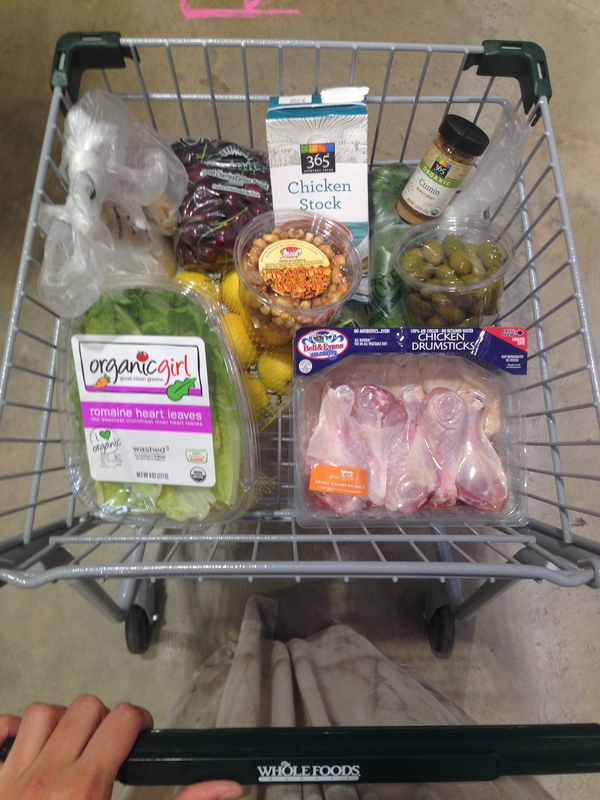 When I made my Braised Moroccan Chicken with Olives awhile back, I made a list, went to the store to shop for the things I needed for this specific night, and then I cooked. (Consequently, I ate around 8:45.) I pretty much only bought what I needed. So when I was planning dinner two nights later, I had to go back to the store. I sure looked weird taking this picture in Whole Foods. Perhaps I’m not a great planner, but I tend to waste food when I buy it ahead of time. I either don’t get to it and it spoils (wasteful) or I don’t want it when it’s time to have it so it spoils (wa$teful). I really like the theory of French grocery shopping. It might be fake, since I’ve never been grocery shopping in Paris, but I’ve seen Ratatouille so I’m pretty sure I’m an expert. You get off work, you head to the market, grab your rosé, baguette and cheese, and you make dinner for the night. Your ingredients are fresh and locally sourced. Your meal is a delight. And you go to sleep full and fantasizing about Jean Dujardin. But that dream, like so many, is about to be crushed. Crushed like that bridge with all the love locks on it. The weight of all that love is about to smother you back to reality. Because you (I) live in America. And you (I) drive a car to work. And you (I) do the majority of your shopping in a grocery store and not a French market. And you (I) work til 6:45 or 7 almost every night. And you (I) don’t always feel like cooking. Or look at the clock you (I) know that if you cook tonight, you’ll (I’ll) be eating at damn near midnight. I suppose there’s no one perfect way to shop. Your way may not work for me. And my way certainly may not work for you. Hell, half the time it doesn’t work for me. But in a weird way, I kind of like it. It keeps spontaneity alive. You’re never going to try something bold if you’re a slave to Taco Tuesday or if you’re eating 8-10 portions of lasagna for a week. Eh, it might be a dream. Sometimes it’s a nightmare. But hey, a dummy can dream.